Interested in supporting local Law Enforcement? JOIN US by becoming a Clark County Fraternal Order of Police Lodge #181 Associate Member, dues are only $25.00 annually and include a Membership card and window sticker. Use the below link to access our membership enrollment form. Just download the below form, complete it, and mail it with your dues to Clark County FOP 181 Secretary, P. O Box 490, Charlestown, IN 47111. 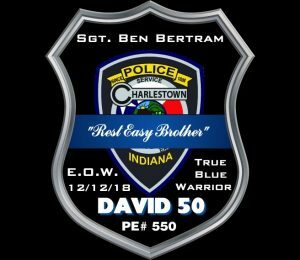 * Active Full Time Police Officers of the Charlestown Police Department, Clark County Sheriff’s Department, Indiana State Conservation Department, Indiana State Police Department, Indiana University Southeast Police Department and Sellersburg Police Department can become an ACTIVE MEMBER of FOP Lodge #181 for $60.00 annually. * Active Full Time Corrections or Reserve Police Officers of the Charlestown Police Department, Clark County Sheriff’s Department, Indiana State Conservation Department, Indiana State Police Department, Indiana University Southeast Police Department and Sellersburg Police Department can become an SPECIAL ACTIVE MEMBER of FOP Lodge #181 for $60.00 annually.